I know what you're thinking! Ok, stop laughing..I know these churros don't look like the usual ribbed ones you've seen in photos but, boy are they heavenly! They are light and delicate and I guarantee you won't be able to stop eating them, till they're gone! And no one will care or know that they're supposed to be a different shape..not unless you tell them! Still without my oven, I chose to make churros because I've never made them before so I thought I'd give 'em a try. As far as the correct gadget to use to extrude them, well first I used a small metal gizmo that I had but it made them too small and thin. Then I pulled out my good 'ol retro Mirro cooky ( yes, that's how they used to spell it!) and pastry press and chose a larger tip to extrude. This worked much better but, of course, not like the star tip would have. Still, they are so amazing. I can't get over how light they came out. My son, Kris, came into the kitchen, asked me what I was making and proceeded to gobble down most of the first batch. So, I urge you to give these a try. I felt sprinkling the cinnamon and sugar on them was enough. Some recipes include a chocolate sauce. A little over the top for breakfast! Maybe next time! So, c'mon, let's get started. In a medium saucepan, bring the water, butter, 1 tablespoon of sugar and salt to a boil. Remove pan from heat and add in the flour. Stir constantly with a wooden spoon until dough forms a smooth ball. Put pan back on low heat for about 1 minute, (just to cook the flour a little) stirring all the time. Be sure your setting isn't too high. You don't want to burn the mixture. Dump the mixture into your mixer bowl and let it cool a few minutes. Drop in an egg and beat til dough is smooth and shiny. Looks pretty, doesn't it? Light and velvety. Heat 2 inches of oil in a heavy bottomed medium pot til it registers 350 on a deep fry thermometer. Spoon your dough into a pastry bag fitted with a large open star tip. ( Or do as I did and use a cooky press fitted with an open tip or star tip if you have one). My second try. These came out much bigger and fatter and much better! Pipe out lengths of dough about 5" long into the hot oil, about 6 to 8 at a time. Cut the dough with an oiled knife. Fry, turning once til golden brown, about 1 to 2 minutes. Be sure the oil isn't too hot or the outside will get too dark while the inside isn't done enough. Mix 1/4 cup sugar and 1/2 tsp. cinnamon in a small bowl and after you've drained them on a paper towel, roll them around in the mixture. Eat at once! In a small bowl, mix 1/4 cup sugar, 1/2 tsp. cinnamon and cayenne ( if using). Set aside. 1. Bring water, butter 1 tbsp. sugar and salt to boil in a medium saucepan. 3. Put pan back on medium heat and cook the flour mixture just for a minute, stirring all the time with a wooden spoon. 4. Transfer the mixture to a mixing bowl and let it cool a few minutes. 5. With mixer on medium, add egg and beat til dough is smooth and shiny, about 3 minutes. 6. Heat 2 inches of oil in a heavy bottomed pan til it registers 350. 7. Spoon dough into pastry bag fitted with large open star tip ( or do as I did). 8. Pipe 6 to 8 lengths of dough about 5" long into the hot oil. Cut dough off with a sharp oiled knife or kitchen scissors. 9. Fry, turning once, til golden brown, about 1 to 2 minutes. 10. Drain on paper towels and toss into the cinnamon sugar mixture. 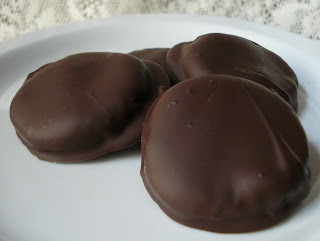 If you like the refreshing taste of peppermint with chocolate then you're going to love these peppermint patties! Remember the TV commercial for York Peppermint Patties with the wind blowing through the woman's hair to give that cool refreshing feeling?..Well, that certainly describes the taste of these minty pucks! I actually had mint extract, rather than peppermint extract. The peppermint is stronger in flavor and I prefer the mint taste but you can certainly use the peppermint extract..they're peppermint patties, after all! And, they're no bake..which brings me to the real reason I made them today. You see, my oven died yesterday..Boo Hoo! So I had to go out to buy a new one..Yeah ! But it won't be delivered for a few days so I have to choose recipes that don't require baking..and this is the first. They are so easy to make and if you'd like them to look really pretty, you can decorate them by drizzling with white chocolate and maybe some green coloring to give a more minty look. Begin by placing the sugar, butter, extracts and heavy cream into your standing mixer fitted with the paddle attachment. Turn the mixer on medium speed and beat another minute or 2 til the mixture looks a bit like paste. Line a cookie sheet with waxed paper and make 1" balls rolling between your palms. Flatten each one with your fingers to make a patty. Place them into the fridge to chill 20 minutes. Melt your chocolate, either double boiler style or in the microwave. Let it cool down to room temp. Once the patties have done their chill time, take them out of the fridge and dip them each into the melted chocolate, shortening mixture, using 2 forks to turn them to coat. Place the coated patties back onto the waxed paper cookie sheet and put back into the fridge to chill 2 hours. After they have done their time in the fridge, you can melt and drizzle with more chocolate, such as white chocolate ( tinted with maybe a green color) for a more minty look. 8 oz. dark or bittersweet chocolate ( I used Belgian Chocolate). 1. With standing mixer fitted with paddle attachment, cream the sugar, butter, extracts and heavy cream. Add the ingredients in that order so they combine correctly. 2. Once the ingredients are combined, turn the mixer to medium speed and beat another minute or 2 til the mixture looks a bit like a paste. 3. Line a cookie sheet with waxed paper and using a teaspoon , scoop out a small amount of the mixture and roll between your palms a 1" ball. 4. Once all the balls are made, flatten each one with your fingertips to make a patty. 5. Chill in the fridge for 20 minutes. 6. While they're chilling, melt your chocolate and shortening in a double boiler or in the microwave and let it cool to room temp. 7. Take the patties out of the fridge and coat each one in the melted chocolate/shortening mixture, using the 2 forks to help you turn them over to coat well on each side. 8. Put them back in the fridge to chill again 2 hours. 9. Store any leftover patties in the fridge, separated with waxed paper. Wondering what to do with any remaining melted chocolate? How about dropping a handful of raisins and peanuts into the chocolate and scoop out clusters. Place them onto waxed paper and pop them into the fridge to chill. YUM! 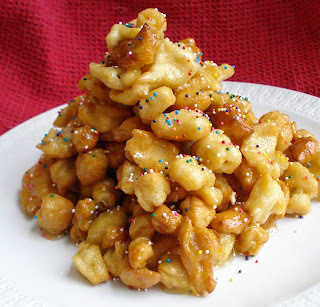 Italian Struffoli, sometimes called honey balls, is a Christmas treat I remember my Italian grandmother, Jennie, making at this time of year. It's fried dough balls mixed with honey, sugar and orange zest and piled high into a cone shape. It's a kind of dessert that gets passed around the table with coffee, as each person can take off as many pieces as they want. Unfortunately, I never had her recipe for making this. The very first time I made this , I'm talking years ago,( not this recipe! ), I remember the balls came out hard and heavy. This recipe, however, I got from a very sweet Italian woman I worked with back in the 80's and this recipe makes the best Stuffoli! I do have to admit it's been a while since I made this and after I was all finished with the recipe I remembered I had prepared the balls a different way that I show ( a much easier way!). So I will include this other option in the directions for you..to make it a little easier for you! Beat your eggs with the vanilla and salt. Stir in enough flour to make a soft manageable dough, stirring in a little flour at a time. And more flour, til it becomes fairly managable. I say fairly because you don't want to add too too much flour or the dough may become heavy. The dough will still be sticky, especially in the center but just flour the large ball of dough enough to be able to pick it up out of the bowl. Place onto the floured counter and knead the dough a few minutes til smooth. Place the ball of dough onto your floured counter and cut in half. Cover the dough and let it rest about 30 minutes in a cool place. Ok..this is where things change!! I rolled out the dough and cut the dough, with a pizza cutter, to get long strips which I then cut into very small pieces. Ok, this is the hard way to do this !! Simply take small pieces of the dough and roll out with your floured hands, on the floured counter, long rope like pieces and just cut these pieces into very tiny pieces. The dough will almost triple in size when you fry them so make sure your pieces are very tiny...fry a sample piece the see what I mean! Here's more of the hard way to do this! And the tiny pieces you'll have when finished! Now, let these tiny pieces rest again about 30 minutes on the counter...I know, another rest! Yes! Now get your oil hot enough ( sample one piece to be sure the oil is hot enough) and place a small batch into the hot oil and fry til just slightly brown. Keep an eye on them as they turn brown very quickly! Don't answer the phone..or anything!! Keep watching them! As you have your batches finished, drain each on paper towels. See mine look like little styrofoam balls!! ( Your's will looks more like just balls!). In a medium saucepan, blend honey, sugar and zest and heat til the sugar is just dissolved. Add the balls and stir to be sure they're all coated with the honey mixture. Pile them in a cone shape onto your preittiest Christmas plate! 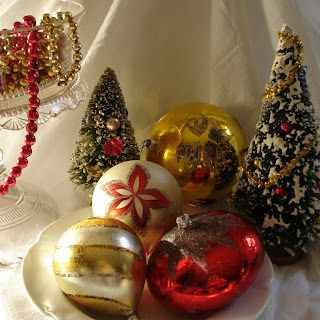 Sprinkle the cone shaped pile of delicious honey balls with the multi colored sprinkles. Enjoy! 1. Beat eggs with vanilla and salt. 2. Stir in enough flour to make a soft managable dough. Mix well. 3. Toss onto floured board or countertop and knead 5 minutes til smooth. 4. Cut in half and wrap in waxed paper ( flour the balls so you can get them off the paper!). 5. Set aside and place in a cool place for 30 minutes to rest. 6. Take pieces of dough and on floured countertop, roll into rope like shapes. Cut each into very tiny pieces. ( 1/4" pieces). 7. Spread on lightly floured surface and let them rest again for another 30 minutes. 8. Heat oil in heavy medium size saucepan and place balls into pan in batches.keeping an eye on them as they brown very quickly. 9. Drain each batch on paper towels. 10. Pour sugar, honey and zest into medium pan and heat to dissolve sugar. 11. Place all the balls into the pan and stir to coat all. 12. Pile them onto a pretty plate into a cone shape. Sprinkle with colored sprinkles. May the wonder that is Christmas touch the child within your heart! This is another one of the retro recipes from my aunt. I remember these growing up but I haven't a clue how they got the name Lincoln Crisps! They're crisp but..what's it got to do with Lincoln??! These cookies are so simple to make. They have a wonderful chewy texture on the inside due to the egg white yet they're crunchy,too! Give them a try! They're really good! Beat egg whites til stiff then gradually add sugar and salt and continue beating til sugar is dissolved. Add melted shortening and vanilla and beat til just combined. Stir in coconut, nuts and cornflakes. Form into clusters on a greased baking sheet about 2" apart. Preheat oven to 350. Grease baking sheet. 1. After beating egg whites til stiff, gradually add sugar and salt and beat til sugar is dissolved. 2. Add melted shortening and vanilla and beat til just combined. 3. Stir in coconut, nuts and cornflakes. 4. Form into clusters on baking sheet spacing about 2" apart. 5. Bake 15 minutes. ( Do not overbake). This cookie recipe had so many good reviews from the Food Network cookie site that I just had to try it. It's another Giada de Laurentis recipe and I thought the use of dried cherries sounded like a great combo with the almonds and almond extract. Now, I'm sure it would have been great..if I only could have found dried cherries in my local markets! ( If truth be told, I actually did find some in the bulk foods section of one market but when I got them home and tasted one, it had an awful almost chemical taste and I couldn't use them. So I had to substitute dried cranberries. The recipe also suggests using dried apricots but the cranberries are red and, you know, we want a festive, holiday cookie! One note: The amount of icing that the recipe makes is way too much ( as noted in a few of the reviews) so just half it, but I will give you the amounts originally given. These cookies are really so good! They are quick and easy to make. The almond extract flavor really comes through and the cranberries and almonds are still a great combo. Start by beating, in a standing mixer, the first 6 ingredients til fluffy. Beat in the egg and add the flour til just combined. Chop the cranberries ( or cherries) so you don't have big chunks in there! I used sliced and toasted almonds and I didn't bother chopping them. I just crushed them with my hand as I put them into the mix. Shape the dough into a log or 2 logs and wrap in plastic and refridgerate for at least 2 hours or overnight. It can be made up to 3 days ahead. Cut the logs into slices 1/2" thick. Space 1" apart on your parchment lined sheet and bake 15 minutes. 1/2 cup slivered blanched almonds, toasted and coarsely chopped. 1. Beat butter, sugar, vanilla, cinnamon and salt til fluffy. 3. Add flour, beating on low speed til just combined. 4. With spoon, stir in cherries ( cranberries) and almonds. 5. Shape into a log ( or 2 logs) and wrap in plastic and refridgerate for 2 hours or overnight. * It can be made up to 3 days ahead. 6. Cut logs 1/2 " thick and place on parchment lined sheet 1" apart. 7. Bake 15 minutes and cool completely on wire racks. 8. Icing: Put sugar into a medium bowl and add vanilla and water, whisking til smooth. Add more water, 1 tsp. at a time if needed. 9. Ice cookies and allow icing to cool. I filled icing into a sandwich baggie and cut a tiny end off the corner to pipe onto the cookies. * Note: Can replace dried cherries with 1/2 cup coarsely chopped dried apricots and add 2 tbsp. toasted pine nuts. Also use 1 tsp. vanilla and omit almond extract. This Florentine Lace Cookie is so pretty and delicate looking. 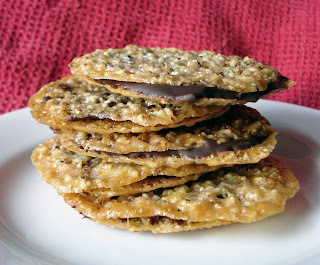 It's a crisp cookie with a great nutty flavor and it's so easy to make. The addition of orange zest gives it even more wonderful flavor, and the chocolate filling makes it even better! However, had I not made another version of this cookie yesterday, I would have not been happy with the results today. Allow me to explain! Yesterday I made a very similar recipe using quick cooking oats instead of the almonds. The recipe went together quickly and very easily and the cookies turned out fine but I noticed alot of other recipes for this cookie used chopped almonds so I thought I'd give that a try and I have to say I do like the flavor better with the almonds and the orange zest that the recipe includes. The recipe is from Food Network. The problem came when I boiled the sugar, cream, corn syrup and butter, then added the dry mixture. The recipe said to allow this mixture to cool 30 minutes but even after one minute the whole mess began to harden as it cooled...then I tried it using the method from yesterday and it was PERFECT! So I will give you the Food Network ingredients recipe but use the oatmeal recipe version for the procedure. It comes out great..trust me! Please, let me know how yours turned out!! I'd love to hear from you! Oh, and if you feel the need for more chocolate, go ahead and drizzle or dip more chocolate on top. Put the almonds into a food processor and pulse til the nuts are finely chopped. Combine nuts, flour, sugar, zest and salt in a bowl. Melt butter in a medium saucepan and take off the heat. Add the cream, corn syrup and vanilla and stir to combine. Add the dry ingredients and stir til it's all mixed together. I found using my teaspoon measure ( for a 3" finished size cookie) to scoop out the dough was the easiest way to get nicely formed round cookies. Press the dough firmly into the teaspoon measure and slip it out gently, trying to keep the formed dough in tact. If this method doesn't work for you then just form it into a small ball. Once you place it onto your parchment lined cookie sheet, gently press it down with your dampened finger, keeping the round shape. Bake and let it cool on the parchment paper for about 5 to 10 minutes til you can easily peel it off the paper. Let it cool completely on a wire rack. Spread some of the chocolate onto one cookie and sandwich the two cookies together. Don't put too much chocolate on the cookie as some "oozes" out between the holes! Let them cool. After they cool and harden, you can drizzle or dip with more chocolate. Never too much chocolate!! Semi sweet chocolate or chips. 1. Pulse almonds in a food processor until finely chopped but not pasty. 2. In a small bowl, combine almonds, orange zest, flour, sugar. 3. In a medium saucepan, melt the butter. 4. Add the cream, corn syrup and vanilla to the melted butter. 5. Pour the dry ingredients into the melted butter mixture and stir to combine. 6. Scoop teaspoonfuls of batter using either a teaspoon measure or your fingers to make a small ball. 7. Place onto your prepared sheet, about 2 - 3 " apart. 8. Lightly press batter, keeping a round shape. 9. Bake approx. 10 minutes, or til cookies are thin and are an even golden brown color throughout. 10. Cool on the parchment sheet for 5 to 10 minutes. Peel the cookie off and let it cool completely on wire rack. 11. Repeat with remaining batter. Melt 2 to 4 oz. of chocolate in a double boiler. Spread a teaspoonful of chocolate onto one cookie and sandwich the two together. Optional: Once completely cooled, drizzle or dip cookie in more chocolate. Keep the cookie stored, between waxed paper in an airtight container.